Production lines are standing idle, people with knowledge of the matter say, even as data shows Japanese steel pipe makers have expanded U.S. exports despite having to cope with 25 percent tariffs. Japanese players have been boosted by offering high-tech pipes for the U.S. oil industry amid an output boom that can't be easily be substituted by U.S. manufacturers, unlike Korean firms' goods. South Korea was the first country to score the exemption back in March, agreed as President Donald Trump set out to level the manufacturing playing field with the rest of the world. The deal meant continued, tariff-free access to Korean steel's 3rd-biggest export market. 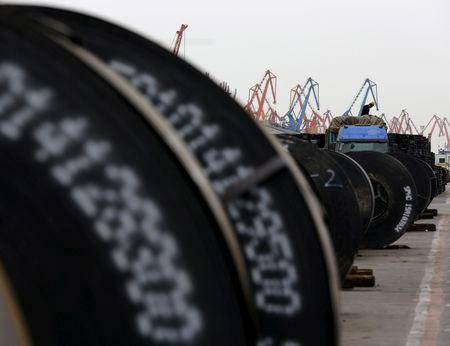 But what should have been a boon for specialty pipe exporters like Nexteel, Husteel <005010.KS> and Seah Steel <003030.KS> turned bust: The quota for 2018, set nearly a third below previous years' volumes, was almost already used up by May when the new system kicked in, leaving Nexteel and Husteel forced to reduce factory run rates until October and November, when they can resume U.S.-bound shipments for 2019. "If the United States goes easy on Mexico and Canada (in trade policy), South Korea's imports may be a burden to them and for that reason, they could trim quotas," said Wonmog Choi, professor of trade law at Ewha Womans University. "We should realise that we're sandwiched between them." South Korea's overall steel exports easily outstrip Japan's by volume: Even capped by the quota, 2.63 million tonnes of Korean steel can be shipped to the United States this year, well ahead of the 1.73 million tonnes exported by Japan in 2017, U.S. data shows. Top Korean steelmakers POSCO <005490.KS> and Hyundai Steel <004020.KS> were not hit as hard by the quotas since the United States accounts for less than 5 percent of their total sales. For smaller players like Husteel, Nexteel and Seah Steel the U.S. market is vital - 70 percent of their exports go there. In the meantime, an official at one pipe maker told Reuters one of the company's five factories has been idled until later this year. "Our run rates have lowered almost by half," said the official, who asked not to be named due to the sensitivity of the matter. He said his firm is considering moving one or two plants to the United States to skirt the quota. A Seah Steel official, who declined to be named due to company policy, said, "We were relatively hit less hard by quotas because we have two U.S. plants... In the mid- and long term, we're considering expanding production capacity in the United States." The U.S. Department of Commerce's International Trade Administration website, using data from IHS Markit-Global Trade Atlas sourced from the reporting country's official statistics, shows the value of Japanese pipe and tube exports to the United States rocketed 84 percent in January-July compared with a year earlier, to $190 million. "Our U.S. production capacity of about 7.1 million tonnes is far greater than our export to the U.S., which were about 600,000 tonnes last year," said Katsuhiro Miyamoto, executive vice president at top Japanese steelmaker Nippon Steel & Sumitomo Metal Corp <5401.T>. "Export volume is capped," said Lee Jae-yoon, associate research fellow at the state-funded Korea Institute for Industrial Economics & Trade. "If South Korea were able to keep exporting, higher prices could have offset (the impact)...even if tariffs were imposed, that could have been better."